Be different. 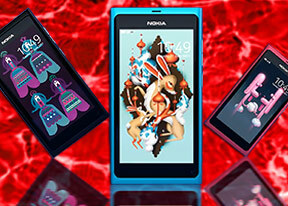 Choose & experience Nokia N9. The only Meego smartphone to date. how can i transfer music files to my n9? why wmv format videos aren't supported by this device......??? Plzz send any clues..
jn043, 28 Jan 2012N9 has a secondary camera that does not make video calls. in fact, does not do anything. wtf !? !Actually it does has use but iy's not built in at the moment. You can download simple mirror or MeeCamhor, the latter is better because it saved your pictures to the gallery. So there you go, front facing camera in action. As for video calls, not yet possible. Wait for PR1.2 for that one. Been using my N9 for nearly one month and it is just awesome. nearly thousands of apps to download and all are working fine. Waiting for update PR1.2 to be released soon and expected to be more user friendly. Is there any software to control APN ON/OFF? If yes, where can i download it? Techno magi, 28 Jan 2012I love nokia, symbian and java. I have an N8 and N9. AnonD-31621, 28 Jan 2012just got my n9 a while ago. how can i use my front camera? and is PR1.2 pre-installed with the... moreno, you can use it only with pr 1.2.
and you can download it in a few weeks! I love nokia, symbian and java. xxxx, 26 Jan 2012clearly, you know nothing about android.pls android lover dont enter this page.bcz we nokia lover dont enter ur page.we love our nokia and we always connect with that.if u like android then why u enter this page u dont pleased with ur and looking for better os,then dont feel proud having ur android. I am 14 years old boy and i love n9 can i buy n9 can its useable for me and can i use its secondry camera for video call?and can i play games on it! got a notification about a device update but i really don't know how to start. anyone please?